One of the areas of the history of the British left that is under-explored is the relationship between the left and gay liberation/rights. Lucy Robinson’s 2007 book is a pioneering work in the field and Graham Willett (who has written extensively about the Australia left and gay rights) has recently contributed a chapter in this collection on the topic. Both Robinson and Willett provide overviews of how a range of left-wing parties engaged with the question of gay rights from the 1960s to the 1990s, including the Communist Party of Great Britain. Both authors describe how the Communist Party first supported in the pages of the Morning Star a National Union of Students motion supporting gay rights and then after pressure from several local branches at the Party’s 1975 National Congress, the CPGB’s Executive Committee finally issued a statement in September 1976. This intersects with work done on the CPGB and the shifts in the Party during the 1960s and 1970s that led to the rise of Eurocommunism, Gramscism and the 1977 version of The British Road to Socialism (and to some, the inevitable decline of the Party). The support for gay rights as part of this shift in the outlook of the Party is mentioned in the work by Mike Waite, Geoff Andrews and Richard Cross, for example. 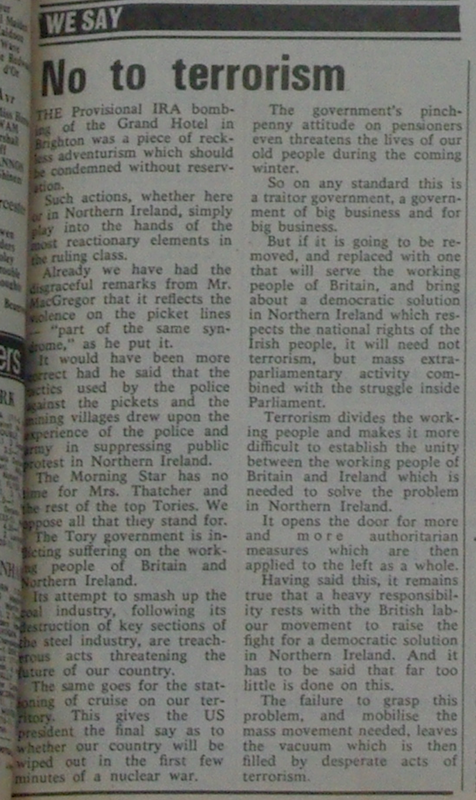 Both Robinson and Willett mention an interview in the journal Gay Left from 1977 with CPGB members Beatrix Campbell and Sarah Benton (editor of the fortnightly Party journal Comment). In this interview (pages 9-13), Campbell and Benton mentioned that this statement supporting gay rights created enormous debate within the Party. Looking through issues of Comment, one can see the differing reaction by different Party members who wrote to the journal after the EC statement was published in September 1976. 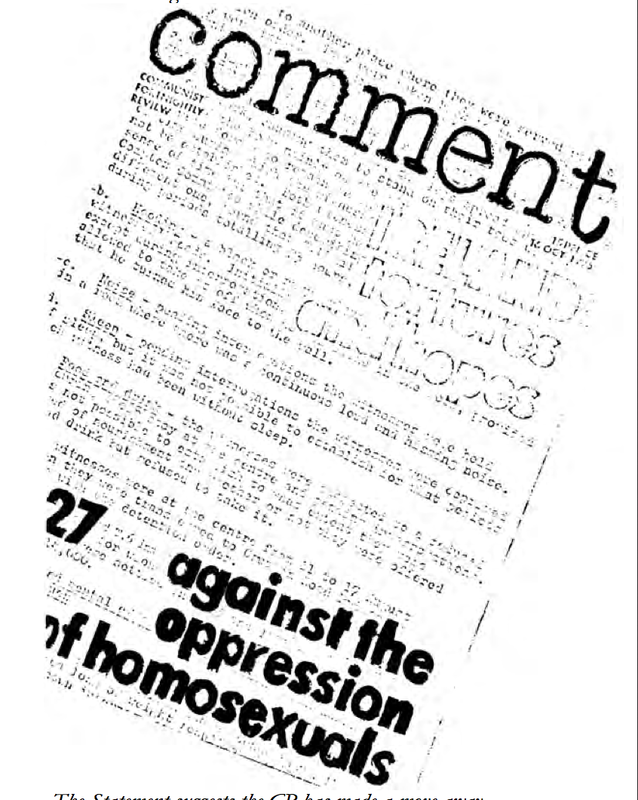 Although just one resource to look at a major policy debate within the Party (there is probably much more available in the Party archives in Manchester), the articles and letters in this journal provide a different perspective on the Party’s changing attitude towards gay liberation. The fact is we do exist, therefore we have a right to exist and enjoy equal civil liberties… Homosexuality is a fact of every society, whether repressed or accepted. I do not think that they gay struggle should be shelved by Communists because it is embarrassing. There are many civil rights to be won. These can only be won when we all turn around and face them. We must help to combat sexist and anti-gay attitudes wherever they are found, including among the left, in the labour movement and in our own party. The Communist Party supports the right of people to be actively and openly gay, and gives support and encouragement to gay comrades to work in the gay movement. In order to assist these changes in law and attitude, the Communist Party will establish a committee to promote discussion and analysis on gay rights, and assist the party in activity on these questions. We as Marxists are concerned with all aspects of oppression… [The Party’s] objectives will themselves be divided and held back if the oppression for example of women, of racial minorities and all other oppressed minorities, homosexuals included, is not actively opposed by the working class. Cook urged that the CPGB ‘declare itself totally opposed to discrimination and oppression against homosexuals’ and with that, they needed ‘to recognise that this means we must help to oppose sexist and anti-gay attitudes wherever they occur, including in our own party’. This was not just to be a top-down decision by the EC and Cook advised that several committees (at national and district level) be established ‘to promote discussion and analysis’. Prejudice and ignorance is widespread throughout the party as well as elsewhere… To dispel this ignorance every branch should hold discussions either with gay comrades or by inviting along to a branch people involved in the gay movement. Finally, I would like to appeal to all gay comrades to come out, It’s like getting into a cold bath, the first step is the worst. All the ensuing hassles are nothing compared to the strength and joy we can get from one another – and we can’t get it if we remain invisible. [W]e can see that homosexuality of the habitual and exclusive kind is a persistent expression of selfish individualism, the socio-political origins and implications of which we should know only too well. In other words, it is a form of love or liaison that functions as an antithesis of normal, evolutionarily selected but plastic sexual activity. [I]t is not so much that the Eysenckian biological arguments are unconvincing (though they are). It is rather that Marxism has always stressed the need to make the start of one’s analysis the differentiation of mankind from the animal world by its constitution as a society. The relation of the struggle for sexual liberation to the class struggle is not an either/or situation. Though linked to the class struggle, the gay movement has its own specificity, and its relation to the class struggle is a complex one. The slow rate of development of sexual liberation in a number of socialist countries indicates that the achievement of socialism does not by itself bring about sexual liberation at the same time. [T]hose sectors who see that the objective conditions of their struggle are similar to those facing the working class in its struggle are people whom the Communist Party must be prepared to support. The tragedy of London, as I see it, the large drift of Northern and Scottish political and apolitical gays who have left their hometowns because they cannot cope with the isolation; nothing is solved, the same oppression still exists in sizeable Northern towns. Many of these migrants are Communists. I hope the new CP policy will seta precedent, and as a result the heterosexual majority of comrades in town branches and provincial districts will help us gay comrades to fight our oppression. For I believe the gay comrades have much to offer and none of us can turn from one sort of oppression when oppression concerns us all. Nothing we can do or say makes homosexuality normal and all I see us doing at the moment is making a laughing-stock of ourselves by letting the whole thing get out of all proportion to its importance. Come down from your ivory towers into the ranks of the party, to the branch meetings and find out what our problems really are, instead of being sidetracked into fighting artificial battles which will do us infinite harm. Long term CPGB member John Hukin also wrote a letter railing against the new position of the Party towards gay rights, using similar arguments to Edwards and Olynyk. Hukin called the statement by the EC ‘ill conceived and premature’ and reiterated the homophobic concern that the Party was wrong to see that ‘homosexuality is a normality, equal to the functions of heterosexuals.’ Like Edwards and Olynyk, Hukin saw homosexuality as a ‘sexual abnormality’ and while he agreed that it should be legal, he was against the ‘absolute free expression’ of gay rights ‘without due regard for society in general’. Like Edwards, Hukin was concerned with the ‘individualism’ of the gay rights movement, claiming ‘the preoccupation of homosexuals’ was ‘the promotion of their own sexual ideas and activities, rather than concerning themselves in the everyday struggle for socialism’. The danger of ideas which are directed at promoting sexual self interest which at the same time begin to challenge the very fabric or organised society namely the family unit, which despite all its problems is till and will be the basis of organised society socialist or otherwise. morality. Bourgeois morality is seen as living in sin, promiscuity. Sexual athletics and bourgeois morality is not seen as good family structure … it isn’t seen as a good solid working class unit. As Graham Willett shows in his chapter, the progressives within the Party eventually won, despite the Party collapsing in on itself during the 1980s, and most left-wing groups moved in the same direction towards the support of gay rights. Nowadays it would be rare to find a left-wing party that did not embrace gay rights in some way (at least on paper), but this was not so clear in the late 1970s and early 1980s. As the movie Pride depicts quite well is that the British labour movement was slow to accept gay liberation as part of its agenda, and arguably the 1976 statement by the CPGB helped to progress these attitudes. The National Archives have just released a series of MI5 files, including a number of files on British Marxist historians Erich Hobsbawm and Christopher Hill. 8 files on Hobsbawm have been released, with two digitised. The first of these digitised files is particularly interesting because it covers the period 0f 1956, when the Historians’ Group of the Communist Party of Great Britain was involved in dissenting actions towards the Party leadership. One of the Historians’ Group’ actions was the writing of a letter that criticised the Party’s support for the Soviet invasion of Hungary, which was intended for publication in the Daily Worker. It was not published the newspaper and thus the letter was sent to the New Statesman and Tribune, who subsequently published on December 1, 1956. I have blogged about the letter here. In the view of the letter to the N.S. (and, I gather, also Tribune) Eric will have to make up his mind pretty soon where all this is leading to. He seems not entirely his own master now. Grant finished the letter by saying that ‘I no longer think the main task of the Hist. Gr. is to “keep sweet” those who have left or are intending to leave’. The second was the transcript of a phone discussion between John Gollan, the new General Secretary of the CPGB, and Hobsbawm. Hobsbawm had written a letter, intended for publication in the Party fortnightly journal, World News, on Lenin and Party factions in the Bolsheviks and how this applied to the forthcoming Special Congress of the CPGB. Gollan said that World News would be printing the letter, but he was disappointed in Hobsbawm’s attitude, alleging that he was misrepresenting Lenin’s argument. if you want the thing in WORLD NEWS, we’re now getting to the stage when everybody points pistols to our heads, if it doesn’t go into WORLD NEWS one week it will go into the New Statesman the next week and frankly I don’t like the whole attitude. there’s a lot of suspicion about the printing which has cropped up in the past… if people knew that responsible statements which are not just silly are likely to get printed they wouldn’t start saying well they’ve had to be printed elsewhere. See comrades want to have it both ways, they want to keep the fight in the Party and they want to keep the fight outside the Party. And you can’t have it like that, life’s not like that. I don’t like this type of attitude. I don’t think its particularly Communist and I don’t think its particularly comradely. The CPGB’s correspondence relating to the New Statesman letter and the dissenting actions of the Historians’ Group’s members are held in the CPGB archive at the Labour History Archive and Study Centre at the People’s History Museum in Manchester. As revealing as this internal correspondence is, the MI5 surveillance files add something else to our knowledge of what was occurring within the Communist Party in 1956. The documents I have discussed here are only the tip of the iceberg! 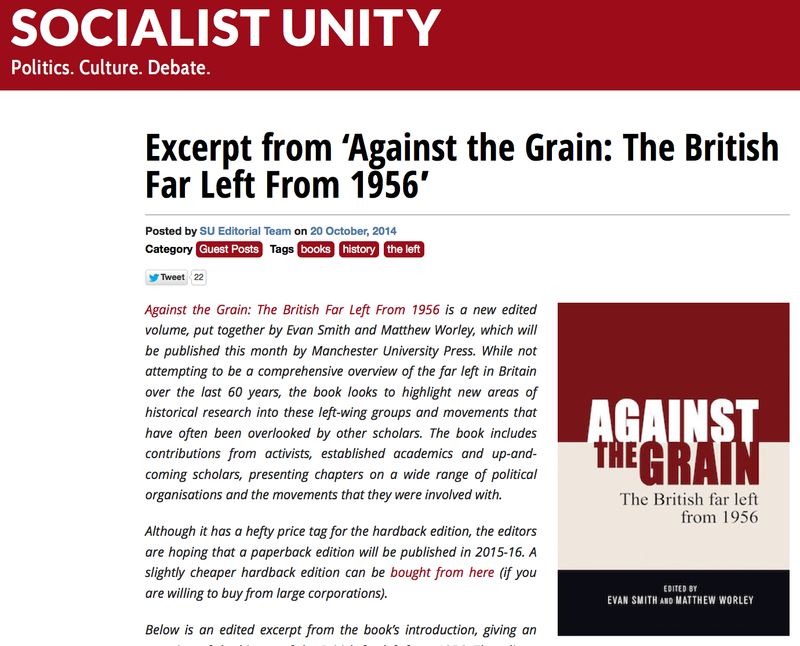 The folk at Socialist Unity have been very kind and have let us post an excerpt from the introduction to our new edited volume, Against the Grain: The British Far Left from 1956, on their website. You can read the excerpt here – but be warned, it is a tad long! We hope that it sparks the interest of some SU readers, as well as spark a discussion. Let the debates begin, I say! Today The Guardian published a very thorough Q&A about European immigration to the UK and addressed some of the routinely asked questions about immigration, particularly as UKIP and the Tories seem to want to make immigration an issue at the next election. As I was reading the article, I was reminded that many of the persistent questions that people have about immigration have existed for a long time and have been addressed, in one way or another, since the 1960s. One of my ideas for a future research project would be to map which questions have been continually addressed in anti-racist literature since the 1960s and how these ‘myths debunked’ or ‘questions answered’ pieces have changed since then. All address the issue of immigration to the UK, although two of the earliest (from 2001 and 2003 respectively) focus on asylum while the latter focus on EU immigration (as well as asylum in the case of one from 2o12). I looked to see whether similar questions were raised in all five and which questions were specific to each piece – hoping to see some some trends and indicators of the wider debate about immigration occurring at a particular time. As part of my research into the history of British immigration control, I had a copy of a 1973 pamphlet by the Runnymede Trust that answered questions on immigration and found that similar questions could be found in the 1970s to those in the pieces from post-2001. How much illegal entry is there? Are the penalties severe? Do immigrants cost the social services as a whole more? Do immigrants cost the health service more? Do immigrants take white workers’ jobs? Do immigrant women go out to work? Are immigrants concentrated in a small number of jobs? Has the availability of immigrant labour prevented modernisation in industry? So it seems evident from the small amount of source material that I have looked at that similar questions about immigration have persisted for a long time, although they are adapted or modified over time. I would like to try this on a much larger scale. Any suggestions of where to find more FAQs would be most welcome. Why have immigrants come here? Why should we oppose racial discrimination if ‘discrimination’ in general is a part of life? How do we know that racial discrimination is common? Is it discriminatory to keep racial statistics? At this stage, this research project is only a pipe dream, but as usual, anyone interested should get in touch. Like July 1981, October 1984 was a crisis point for Margaret Thatcher’s Conservative government. The miners’ strike was now six months in and Thatcher faced possible strike action by the pit deputies’ union, Nacods, which would have increased the severity of the strike. If Nacods had initiated strike action, many believe that Thatcher would not have been able to endure the effect that it would have on the British economy. 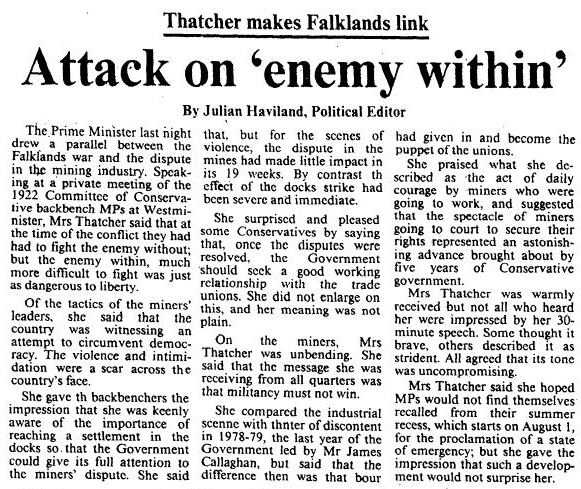 In July 1984, Thatcher had addressed a private meeting of the 1922 Committee, a pressure group within the Conservative Party, and has referred to the miners as the ‘enemy within’. From papers released by the Margaret Thatcher Foundation this month, we now know that she was going to return to this theme at the Conservatives’ 1984 Party Conference, to be held in Brighton. However the Brighton Conference became known for a different set of events. On the morning of October 12, 1984, a bomb planted by the Provisional IRA exploded in the hotel hosting the conference. Five people, including one MP, were killed and another 31 were injured. It was revealed this week that Thatcher ripped up her original ‘enemy within’ speech and gave a defiant speech to those who remained at the conference. In the week of the bombing, the Tories lead over Labour was 2 per cent, according to The Guardian/ICM polls, but this rose to 9 per cent the following month. The Tories experienced a fillip in the polls until February 1985 when they returned to a 2 per cent lead. But resentment towards Thatcher was still high and many were unsympathetic about the near miss. 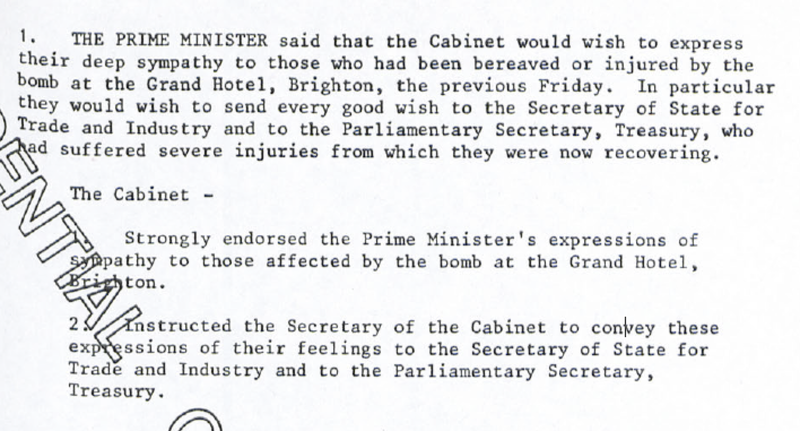 Cabinet’s response to the bombing: CAB 128/79/10, National Archives, p. 1. I wondered how the British far left responded to the bombing in the midst of one of the most important strikes in contemporary British history. Thanks to the staff at the Working Class Movement Library in Salford, I was able to get copies of the Morning Star and Socialist Worker from the days following the bombing. As socialists we give full support to all those who fight oppression and for the right of self-determination, whereever in the world they may be. This applies equally to the Provisionals, who are fighting a war against the oppression of a minority in Britain’s oldest colony. But this does not mean that we necessarily support the politics of the Provisionals, nor we consider them socialists, nor that we support all the tactics they use. The Provisional IRA bombing of the Grand Hotel in Brighton was a piece of reckless adventurism which should be condemned without reservation. Terrorism divides the working people and makes it more difficult to establish the unity between the working people of Britain and Ireland which is needed to solve problem in Northern Ireland. It opens the door of more and more authoritarian measures which are then applied to the left as a whole. The failure to grasp this problem, and mobilise the mass movement needed, leaves the vacuum which is then filled by desperate acts of terrorism. Indeed it would have made it easier for the system to continue in both Britain and Ireland. In Britain it would provide a wonderful excuse for the Tories to increase their repressive powers. In Ireland, it would have encouraged the illusion that a few courageous people with guns and bombs can act as a substitute for the struggles of the mass of the people. The only thing which can shift an employing class is the mass activity and resistance of those its exploits. No amount of individual heroics or clever military stunts can substitute for that. Red Action supported local Irish activities and sustained practical political contact with Republican paramilitary organisations. Red Action believed that genuine revolutionary socialist groups should place Irish national liberation high on their agenda.64 According to Red Action the liberal left in Britain had, in effect, abandoned the issue of ‘Northern Ireland’ when the struggle for civil liberties was transformed into an armed insurrection. Even the Trotskyist left, which had the habit of offering ‘conditional support’ for Republicanism, was decidedly equivocal when it came to the use of armalites and semtex… Red Action, on the other hand, resolved to offer unwavering support. 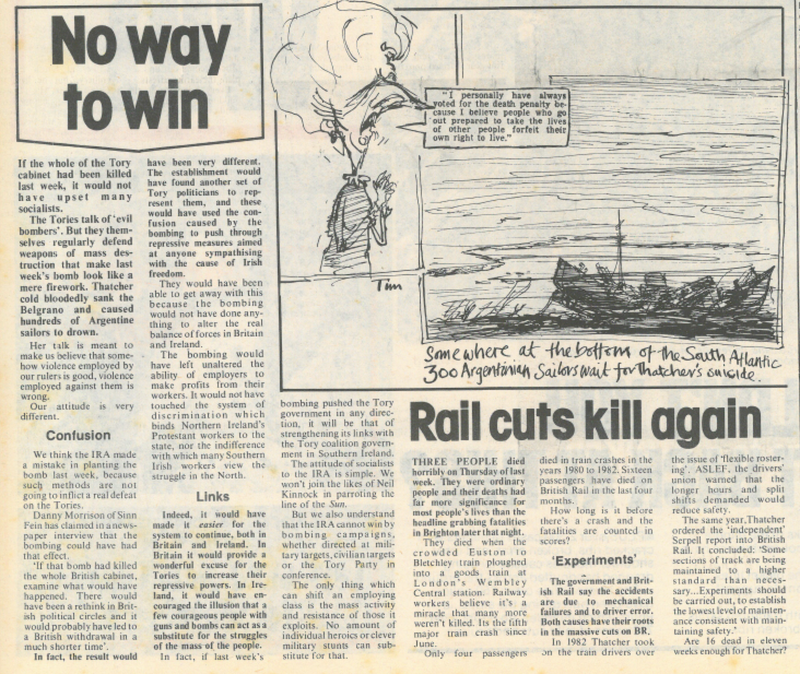 Issue 15 of Red Action from November 1984 contrasted the IRA bombing with the sinking of the Belgrano by the British (under Thatcher’s orders) during the Falklands War and argued that violence was given a moral worth depending on who perpetrated it. 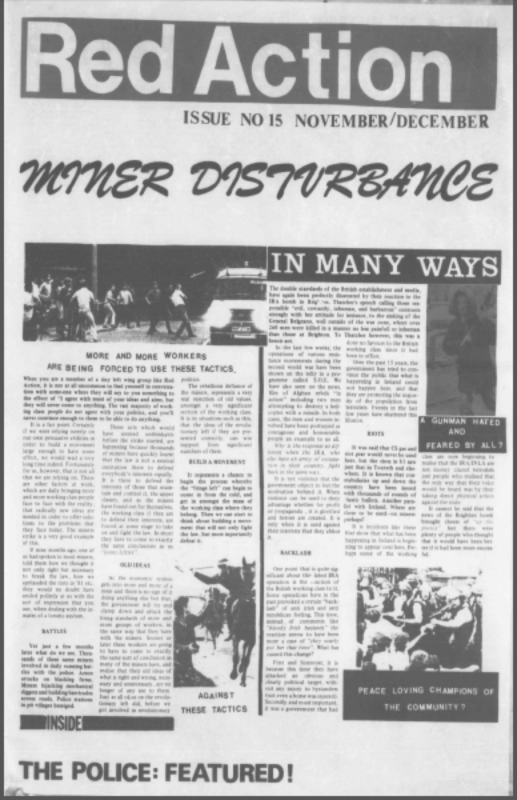 The paper noted that the reaction from the working class towards the bombing was quite muted and that this had changed from the anti-Irish sentiment that was prevalent during the 1970s. It was argued that this latest bombing incident was different because it ‘attacked an obvious and clearly political target’ and because the government ‘had done no favours to the British working class since it had been in office’. Perhaps some of the working class are now beginning to realise that the IRA/INLA are not looney crazed terrorists – just people who realised that the only way that their voice would be heard was by their taking direct physical action against the state. It cannot be said that the news of the Brighton bomb brought cheers of ‘up the provos’ [sic] but there were plenty of people who thought that it would hsve been better if it had been more successful. The Brighton bomb gave Thatcher a brief respite from the pressure of the miners strike and public opinion swung behind her momentarily for the first time really ‘since the Falklands War. But many of those who were involved in the strike did not sympathise with Thatcher in the wake of the bombing, although most were critical of the strategies used by the Provisional IRA. The bombing also solidified in her mind that the ‘enemy within’ was a clear and present threat, even though if she wasn’t willing to say it on October 13, 1984 – Irish Republicans, trade unionists, communists, etc, were to be handled with the necessary toughness that the situation required. This line of thinking informed the political and criminal justice outlook of the Thatcher government until its end in November 1990. This is just a quick post to note that my review of Sheila Fitzpatrick’s A Spy in the Archives (Melbourne University Press, 2013) has been published in the latest issue of Agora, the journal of the History Teachers’ Association of Victoria. As the journal is not really available online, I have posted a pre-print version of the review below. Sheila Fitzpatrick’s second memoir, A Spy in the Archives, begins with a story of being denounced as something akin to a spy by a Soviet magazine when she was in Moscow during the late 1960s on a research trip. This denunciation had to possibility of being quite harmful for Fitzpatrick’s research and her liberty but, as she explains, no one in her circle seemed aware of it and it was only when she returned to her university in Oxford that people brought it to her attention. Fitzpatrick’s book leads with this anecdote, but the rest of the memoir doesn’t discuss this episode in any further detail. While this might be construed as a disappointment by some readers, Fitzpatrick’s stories about being an Australian/British PhD research student in Moscow during the early Brezhnev era are fascinating in themselves and do not need the opening account to make them compelling reading. For those interested in Soviet history and in academia, Fitzpatrick’s memoir opens up two engrossing worlds of a bygone era. She first visited the Soviet Union in 1966 and was a frequent traveller to the city as a doctoral student through to 1969. She arrived in the Soviet Union during the ‘thaw’ in Soviet cultural society that had begun under Khrushchev and continued somewhat under Brezhnev. An increasing number of foreign visitors (including students) were travelling to the Soviet Union in the 1960s, but as Fitzpatrick describes were viewed by the Soviet authorities as potential threats to national security and by ordinary Soviet citizens as captivating oddities. Fitzpatrick’s topic of research was the work of the first People’s Commissar for the Enlightenment, Anatoly Lunacharsky. Partially through the figure of Lunacharsky and the position he occupied in post-Stalinist Russia, Fitzpatrick is able to describe Soviet culture in the mid-to-late 1960s as it came to a crossroads. Lunacharsky had been removed from the public record during the purges of the late 1930s and was ‘rehabilitated’ in the Khrushchev era, but his collected works had yet to be compiled and his biography remained to be written. By studying the works and political output of Lunacharsky in the 1920s, Fitzpatrick was delving into how the philosophical idealism of the ‘Old Bolsheviks’ translated into practical actions in the post-revolutionary period. However, at the same time, she was also delving into contemporary political debates about the relationship between Soviet-styled socialism and humanist principles. A large section is dedicated to her relationship with the ‘defenders’ of Lunacharsky, his daughter Irina and his secretary and brother-in-law, Igor Sats. Through Sats, Fitzpatrick encountered the world of Soviet intellectuals and the debates that raged around literary journal, Novy Mir. Most famous in the West for publishing the work of Alexander Solzhenitsyn, Novy Mir pushed the envelope about what could be publicly criticised in Soviet society and Fitzpatrick colourfully illustrates this era of relative intellectual freedom – giving a sense of how the ‘socialism with a human face’ thesis spread in places such as Czechoslovakia before the Brezhnev regime cracked down on this kind of thinking. The authoritarian nature of the Soviet regime, which would quickly put down the Czech attempts at this socialist humanism, bubbled shallowly below the surface and Fitzpatrick highlights this very nicely. Throughout the book, there are references to the ever present threat of Russian spies trying to lure foreigners into compromising positions (thus potentially turned in to a Russian asset), with Fitzpatrick recalling several efforts to entrap her using friendly Russian (or Eastern European) men. She ponders at different points within the memoir whether her room and belongings were secretly searched by KGB agents and describes how foreigners never really felt at ease in the Soviet Union – not until their plane took to the air from Domodedovo airport. But while Fitzpatrick does not shy away from showing the sinister side of the Soviet Union in the 1960s, she also clearly had fallen in love with the place (and repeatedly mentions that she prefers Moscow to Oxford). The book is very humorous in places, when she describes some of the oddities of Soviet society, such as the absence of telephone books, street maps, restaurants and hardware stores. She does well to describe the liminal space that foreign students occupied in the Soviet Union – they were not ordinary Soviet citizens, nor were they short-term tourists where everything was catered for and organised, so foreign students had to become masters at getting by on their own and learning how to ‘fit in’ with the wider population. For those in the world of academia, A Spy in the Archives also reveals some things about academic life that have changed dramatically since the 1960s and some things that seem to have been ever present. Fitzpatrick enters the Oxbridge world of nepotism just as some of the more egregious practices were being phased out, but some of her descriptions of the ‘old boys club’ that she encountered at Oxford remind the modern reader of how elite universities used to run. But then again some things that she describes give the impression that academia has not changed at all, such as the fractious relationships between students and supervisors, the ‘onemanupship’ of tenured professors and the petty bureaucratic nature of some archival staff. 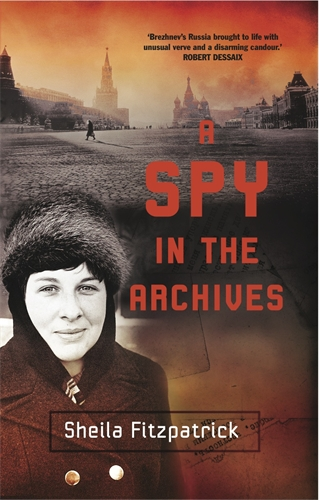 Overall, A Spy in the Archives is a very enjoyable book that weaves personal memoir with social and cultural history. Although possibly aimed at historians and academics, Fitzpatrick’s writing style will make this a wonderful read for anyone interested in modern Russian history and the historian’s craft. High on the excitement of a potential by-election victory this week, UKIP’s Nigel Farage has called for immigration restrictions on people with HIV. This proposal has been roundly criticised as prejudiced against people with HIV, as well as impractical (as argued by The Guardian‘s Sarah Boseley). But Farage’s suggestion taps into a longer history of the UK border control system being used to screen and reject incoming people who were viewed as ‘unhealthy’ or a threat to the health of the body politic. 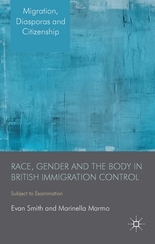 Below is a short excerpt from our new book, Race, Gender and the Body in British Immigration Control, that provides a bit of historical context for this, looking at how the border control system was used to prevent people from entering the country for ‘medical reasons’. People interested in this might also want to check out this 1983 article by Paul Gordon and this 2006 volume edited by Alison Bashford (who has written extensively about this subject in the Australian context). 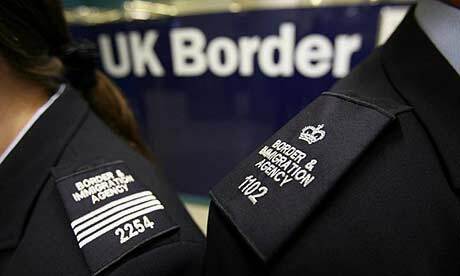 The ways in which the physical body was to be examined within the British immigration system were codified in the various pieces of immigration control legislation and the internal instructions for immigration control staff and medical examiners circulated by the Home Office and the FCO. Officially, the primary purpose of the medical examinations to be conducted upon arriving migrants was to detect any health issues that might threaten the domestic population (and the migrant themselves); but this rationale was often used to disqualify ‘undesirable’ applicants and to extract further information from applicants (which could then be used to interrogate their claims if deemed unreliable). (a) if it appears to the immigration officer on the advice of a medical inspector or, if no such inspector is available, of any other duly qualified medical practitioner, that he [sic] is a person suffering from mental disorder, or that it is otherwise undesirable for medical reasons that he [sic] should be admitted. (2) Any such person, if he [sic] is seeking to enter the United Kingdom, may be examined also by a medical inspector or by any qualified person carrying out a test or examination required by a medical inspector. The Immigration Rules concerning medical examinations put forward that the ‘general aim’ of such examinations was ‘to enable [the] Immigration Officer to refuse entry to persons having a serious illness which might endanger the health of others’ or ‘persons suffering from a mental disorder or some serious condition which would prevent them from supporting themselves and their dependants’. [iv] However medical examinations were used to discredit the claims made by potential migrants and to intensify the scrutiny placed upon them. The scrutinising gaze of the immigration control system was thus cast upon the physical body as a marker of ‘truth’ when other forms of evidence (such as oral testimony and written documents offered by the applicants) were considered to be unsatisfactory. Under the intense scrutiny of the border control authorities, if testimony and documents were not considered to be adequately convincing, the focus of the authorities shifted to physical examination, with the body becoming the marker of ‘truth’. As Didier Fassin and Estelle d’Hallunin wrote about refugees in the French border control system, ‘their word is systematically doubted [and] it is their bodies that are questioned’. [v] Unlike Foucault’s concept of torture, whereby the physical body is manipulated to extract the confession of ‘truth’ and the ‘truth’ is uttered or written by the tortured individual[vi], in the context under examination here the body becomes a text that is ‘read’ by the authorities, and the ‘truth’ is thus determined by those who ‘read’ it. In this process, the body reveals what the authorities want to see. [i] ‘Instructions to Medical Inspectors’, n.d., FCO 50/132, National Archives, London. [ii] ‘Medical Examination Overseas of Commonwealth Citizens Coming to the United Kingdom’, n.d., p. 2, FCO 50/132, NA. [iii] ‘Advice to Medical Referees’, n.d., pp. 102, FCO 50/284, NA. [iv] ‘Instructions to Medical Inspectors’, p. 1, RCRF/1/08, Runnymede trust archives, Black Cultural Archives, Lambeth. [v] D. Fassin and E. d’Halluin, ‘The Truth from the Body: Medical Certificates as Ultimate Evidence for Asylum Seekers’, American Anthropologist, 107(4), 2005, p. 598. [vi] See Michel Foucault, Discipline and Punish: The Birth of the Prison (London: Penguin Books, 1991) pp. 35-42; Michel Foucault, The History of Sexuality Vol. 1 (London: Penguin Books, 2008) pp. 58-61.